I started work on this guy the other day and after getting his base built, I assembled him and primed him. 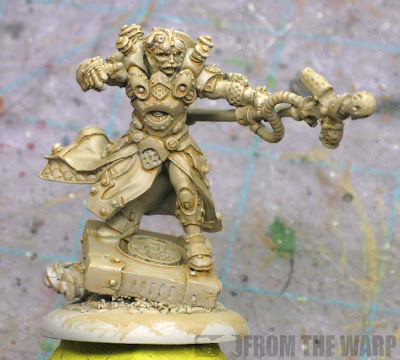 I opted for the light grey primer after seeing how much white (more like lighter colored areas) was on the model. I know you can't see it, but I took the recessed area inside the lip of the base and filled it with greenstuff and sculpted a stonework pattern in there. Not much shows after attaching the model, but it's enough to tie this guy to the rest of the force that was put onto resin bases. 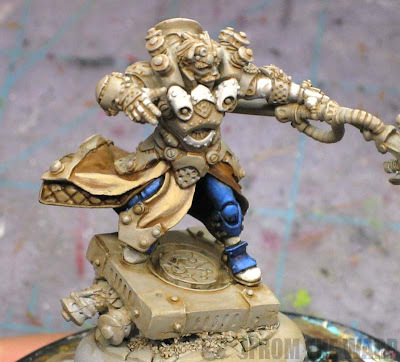 I had planned on priming him with a rust brown color in order to give him that rusted feel by allowing it to show through in the deepest recesses. The only trouble with that was the brown would have been dark enough to require me to do a number of basecoats to get the white areas smooth and consistent again. Since I wasn't too keen on painting a hundred layers to get all the white areas back up to white, I cheated a bit. I went with the light grey primer to make painting the white easy and then gave the whole model a wash of thinned GW Calthan Brown. This collected in the recessed areas but still left the majority of the model light colored. Enough to make my work easier. When it came to painting him, it's not like I was working on a regular Space Marine. I really had to stop and think about how I was going to do it and how I was going to try and make it as easy as possible. I did not want to paint a section only to find out it made painting the next portion incredibly difficult. I ended up working from the inside out like I normally do. That allows me to clean up areas as I go along. In this case, I also started at the bottom first and painted that area separate. It meant having to to the blue armour in two sections along with the white, but it made it easier for me in the end. I finished everything from the waist down and then worked on the upper portion of the model. This is the first model I've ever painted like that. I think it's because of the cape he has that goes all the way around his waist. If I'd have painted the blue above it at the same time I painted his legs, it would have made it tough to get the cape done. I would have had to watch my brush strokes so I didn't get anything on the finished blue areas above and below it. The blue on the model started out as GW Enchanted Blue that I worked up through two more colors (brand-X paints). I finished it off with a thin line highlight along the prominent edges and a few passes of GW Asurmen Blue wash in the recessed areas for some contrast. You can see where I've worked up some of the white areas as well. Using thinned GW Skull White, I made a few passes over each area keeping in mind where the light source was. I left the lower (shaded) areas the original grey with the brown wash showing to give the white areas some overall color. Once I had the blue and white down (which made up the majority of the model) I started in one the smaller elements like the metallics and object source lighting. The base was left for last since it would get the most weathering and I wasn't sure I could match the effect in the picture I had to be honest. pretty slick so far. Can't wait to see the rest. Longscope: Would you believe the base came out the best. It was the part I was most worried about and it worked out in the end. Once I get all the final pics uploaded, I'll post the results. DeathBringer: Thanks. I'd say yes overall to answer your question. 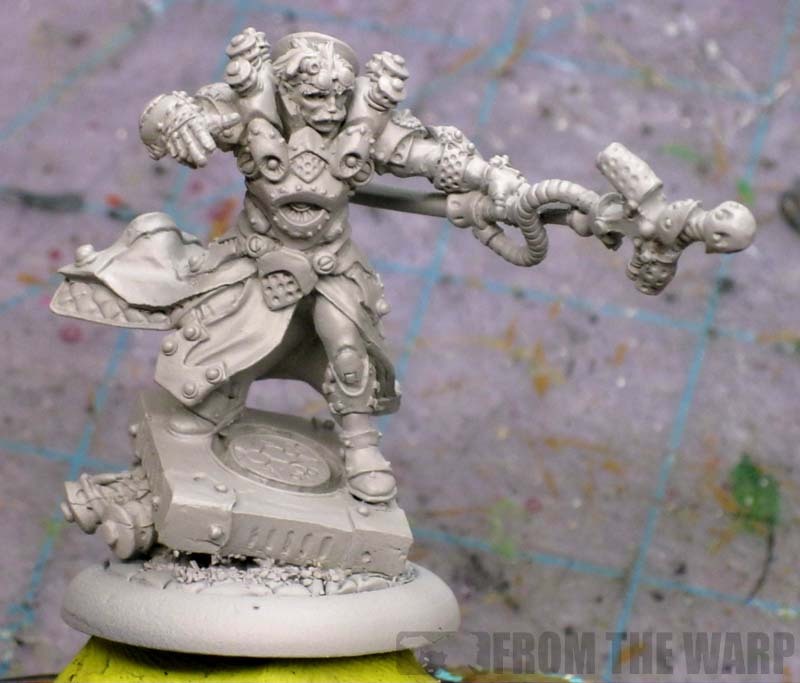 The biggest thing for me was that they felt a bit smaller in size than the GW sculpts and the detail was finer. Now the only thing I have to go from is this one model so my experience is very limited. The model is metal so it has the normal clean up process. I didn't find it to be any different than cleaning any GW metal models. Since the model was a bit smaller, the joints could be tough to pin in some cases... I could see that being a complaint. Generally from my experience playing warmachine they are fantastic models. Good detail overall. That's why I don't understand the overall hate in the community for warmachine models. I feel they are equal to or better then many 40k models.